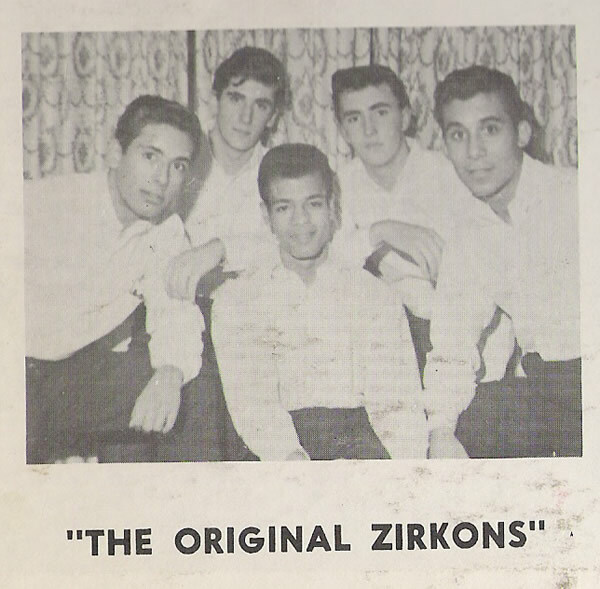 The 1963 original Zircons were a East Harlem group that consisted of James Grenetsky, lead, Donald Lewis, John Loiacono, Kenneth Pulcino and Neil Colello, (This group is often confused with the Bronx group of the same sounding name but spelled Zirkons instead of Zircons), This East harlem group only made one recording , on MelloMood, Lonely Way and the flip side was Your Way , with music. William Andriach has left a new comment - Mario Ibanez was my Father. I never knew this about him and this great to see. Neal Stuart has left a new comment - Please update your website to include me (Neal Stuart Schneberg). You can verify with Eddie Black that I performed the song “ Lone Stranger” (Cat-Time LP 4201, released 1965). 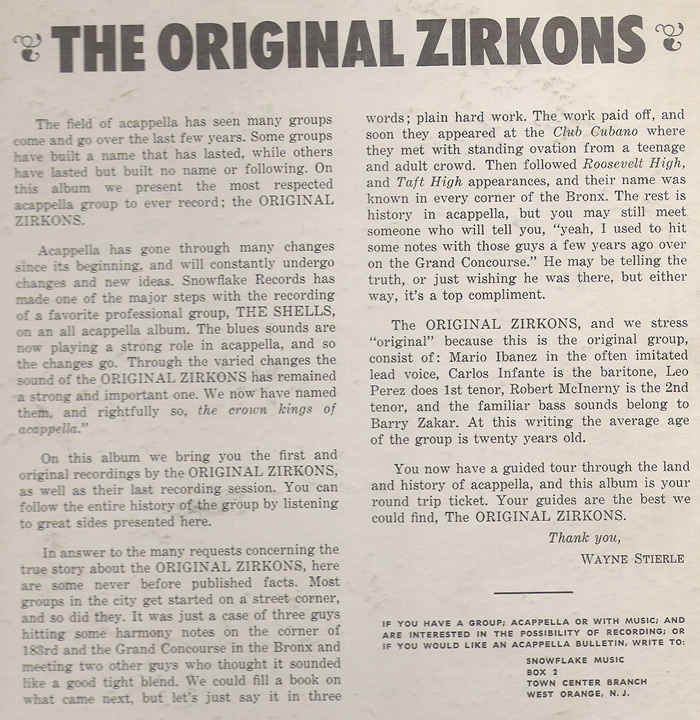 To add to the confusion, the first Zirkon recordings spelled the name Zircons, like the East Harlem group. Both groups appeared on Best of Acapella Vol 1 as the Zircons, Lonely Way by the East Harlem Zircons and Stormy Weather and Silver Bells by the Queens Zircons/Zirkons. 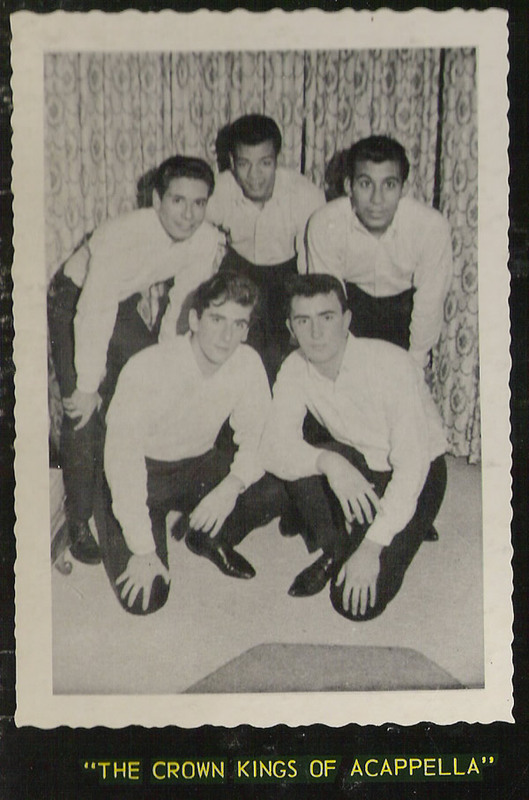 The I Dig Acappella records also spelled the Queens Zirkons with the same spelling, Zircons, as the East Harlem group. The Zircons who did Stormy Weather, Silver Bells, The Lone Stranger and others were from The Bronx, not Queens. Someone later put a home practice tape of them out on an LP pictured above, with the spelling, The Zirkons.